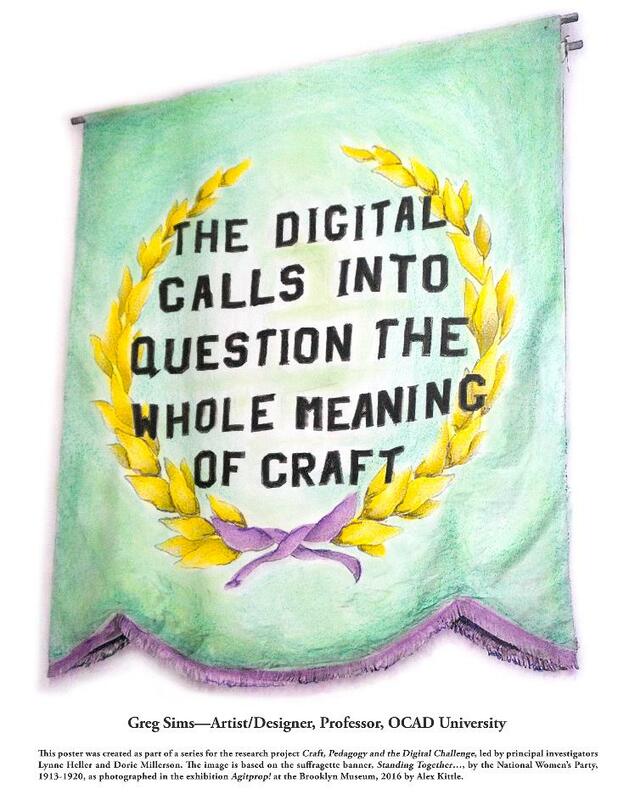 Thinking Through Craft and the Digital Turn is an ongoing research project. Notions of craft and working by hand are inextricably linked in the popular imagination. Yet today's craft studios feature technological innovations such as 3D printing, laser cutting and computerized textile machinery. 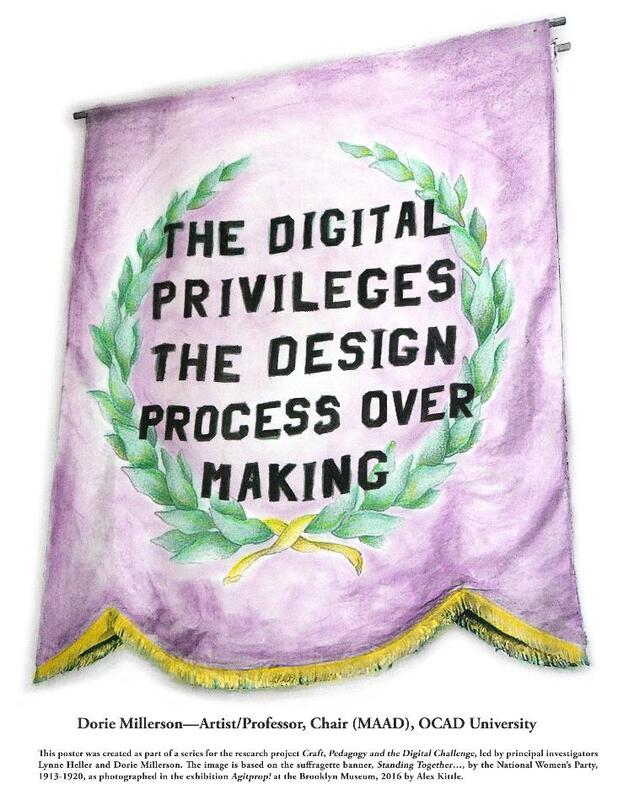 Students, faculty and technicians, in university studio departments, develop and explore the relationship of handwork to digital technologies daily. This study focuses on questions of how digital technologies intersect and combine with traditional, mechanical and hand fabrication processes, particularly the possible affordances of digital technology through embodied learning, a pedagogy of the whole body not just the intellect. 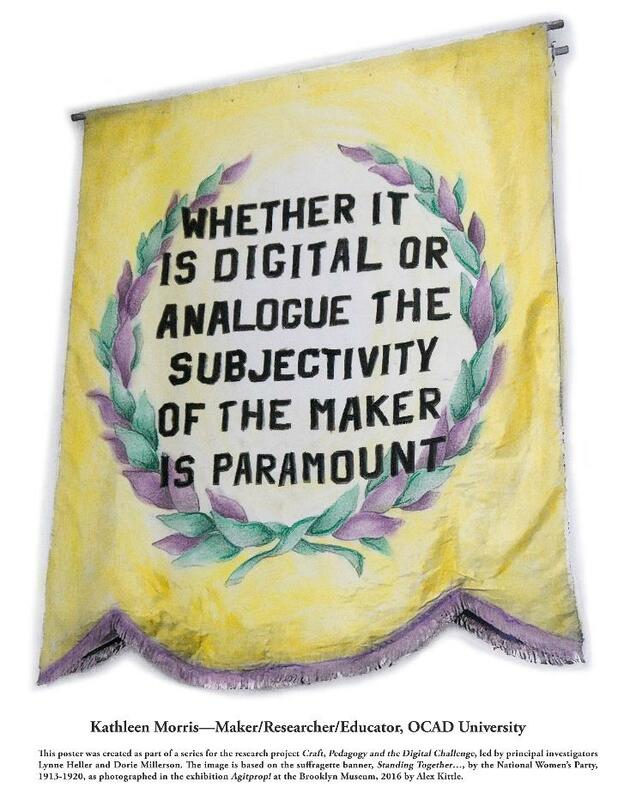 The discourse is complex, however, autonomy and agency---the control of creative methods and output through materiality, tools and process---are central concerns in craft methodology. We interrogate the concepts of re- and deskilling as they pertain to craft and the digital turn. 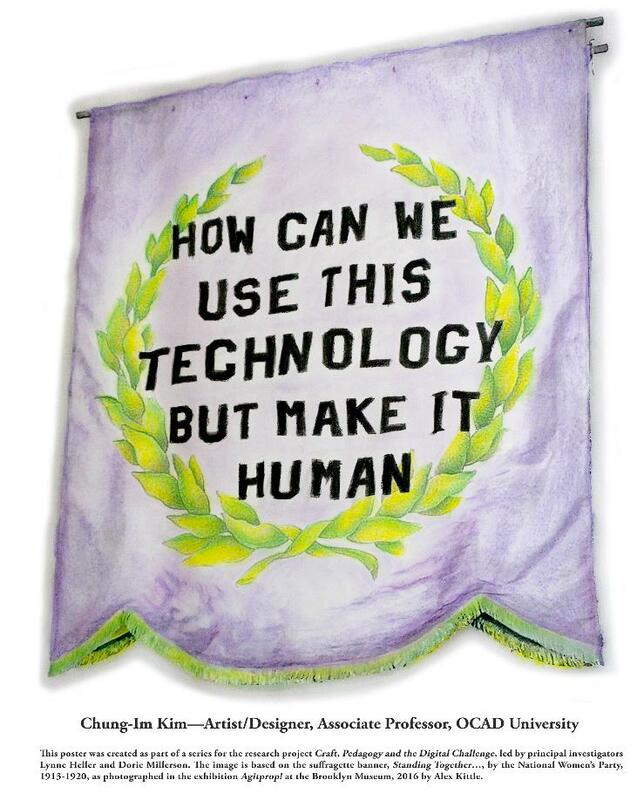 In 2016, a study titled Craft, Pedagogy and the Digital Challenge sought to consider the place of teaching and learning digital craft at OCAD University from the perspectives of faculty, staff, and technicians. It identified the challenges of merging traditional techniques with the digital tools within an institution and finding ways of improving the gap between students, faculty, staff, technicians, and their work. 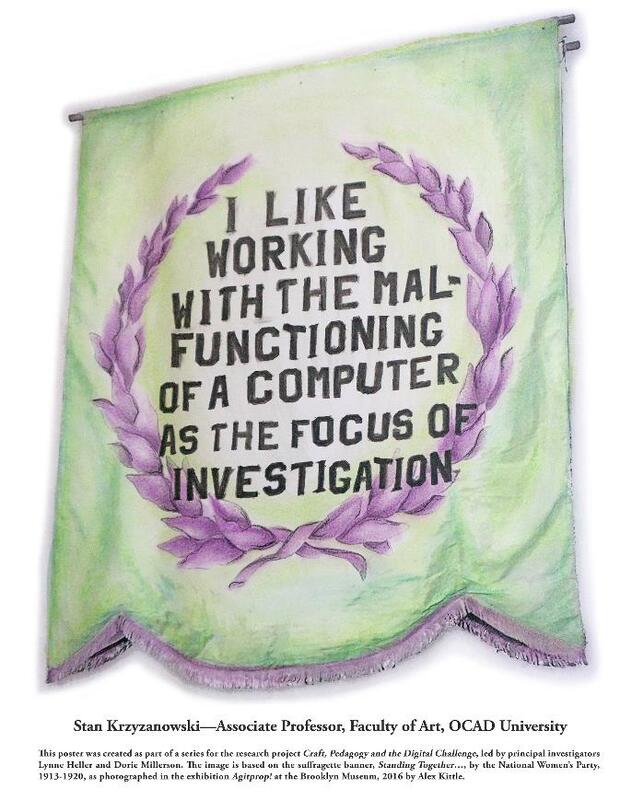 OCAD Faculty, staff, and technicians who teach and facilitate traditional and digital craft methods provided insight and their perspectives through interviews. This research was inspired by the teaching environment of the Material Art and Design program, which includes the study of ceramics, jewellery and textiles practices. 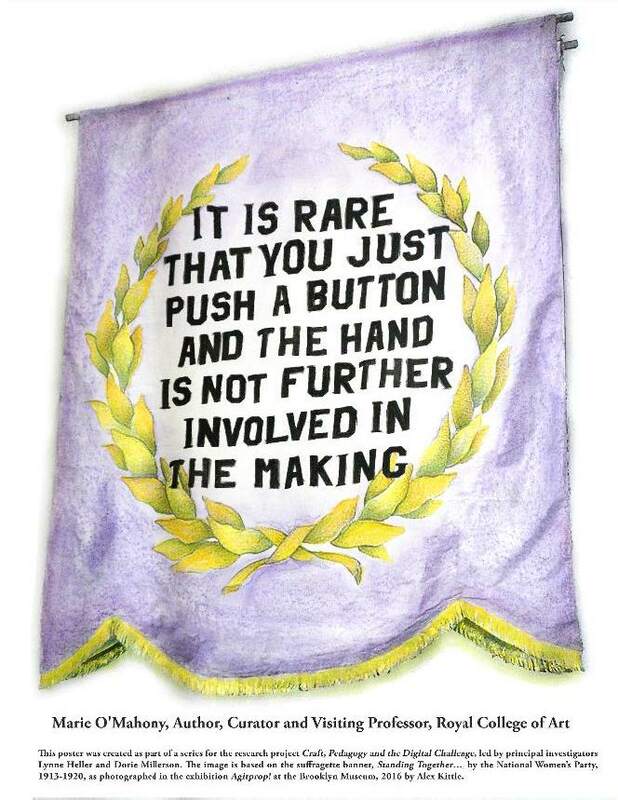 Research questions included, "What is the relationship between craft making traditions and the advent of advanced digital tools, and what are the pedagogical implications of that confluence"? A number of faculty, staff and technicians who teach or facilitate digital craft methods were asked to participate in an interview for the Thinking Through Craft and The Digital Turn project. After consenting to participate in an interview and video, participants were given a list of questions in advance. Questions asked participants to discuss experiences in learning and teaching digital craft methods with reference to how they set goals or evaluate digital processes and what they see as the future of digital craft teaching. During the interviews PIs Heller and Millerson encouraged participants to answer or expand the questions in their own ways, which led to a variety of findings. During the interviews RA Ellie Manning documented audio and visual material to create a video that was used in part to frame the presentation at the Canadian Craft Biennal (CCB) Conference on September 15th, 2017. In addition to the video, RA Claire Bartleman and PI Lynne Heller created a Research Wall in the host lab, the Data Materialization Studio. The Research Wall facilitated a visual and research-creation approach to the data collected and the theoretical stances being explored. After the interviews, the research team chose a quote from each interview that best represented its participant. 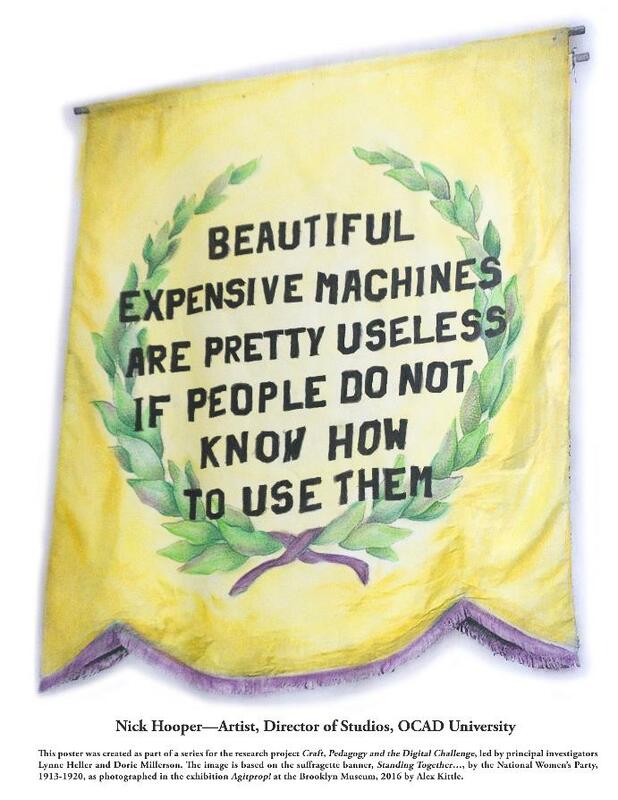 Quotes were then incorporated into posters designed by PI Lynne Heller. 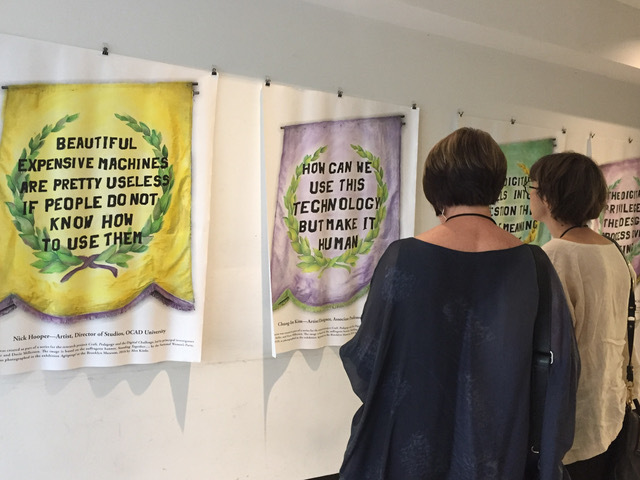 The posters were hung in the entrance to OCAD U during CCB conference proceedings. The intention in documenting and attributing quotes was to give a voice to the participants and draw attention to the findings of the project. 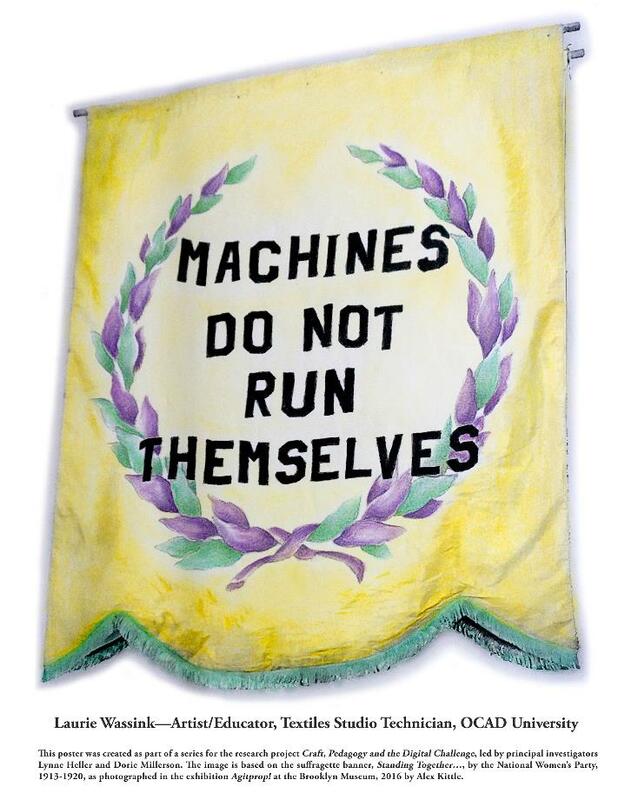 The posters utilized a suffrage banner format as a framing device (based on the poster Standing Together ... by the National Women's Party, 1913-1920, as photographed in the exhibition Agitprop! at the Brooklyn Museum in 2016 by Alex Kittle). The CCB Conference was well-attended and Hands on the Tech: Craft, Pedagogy and the Digital Challenge was scheduled for the session "Making Education: The Changing Nature of Teaching Craft", which was facilitated by PI Dorie Millerson and included papers from across the world. Heller and Millerson summarized their findings through the video, which was followed by a PowerPoint presentation. Afterwards, in a lively Q&A session, members of the audience asked questions about approaches to intersectional feminism within this context. 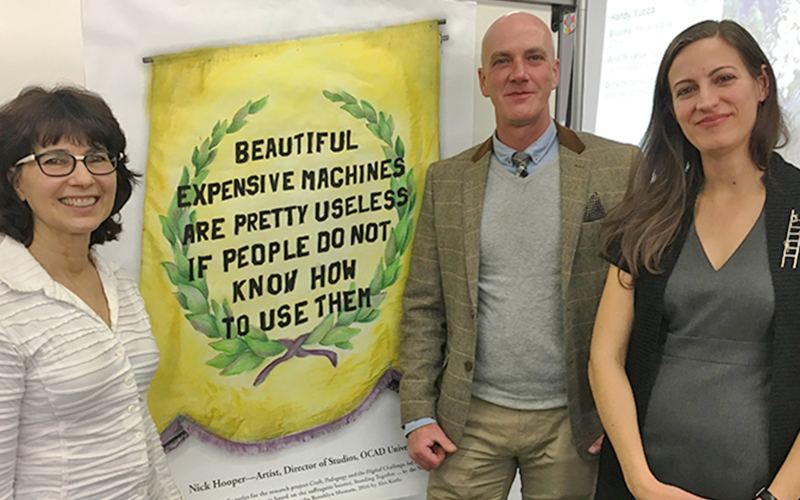 The CPDC team described teaching practices that encourage students to investigate their own identities through their work and commented that there is an unequal gender representation in Material Art & Design that should be better understood and discussed. 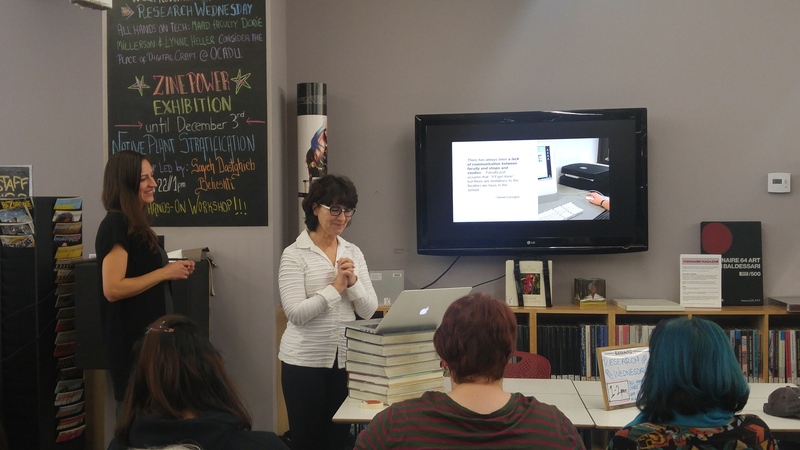 Moving forward, the Thinking Through Craft and The Digital Turn team is engaging student voices and collecting the findings, along with theoretical analysis, into an edited anthology focused on the relationship between teaching and learning digital craft. In order to expand the research across Canada the team has also applied for an Insight Grant from the Social Sciences and Humanities Research Council of Canada (SSHRC). 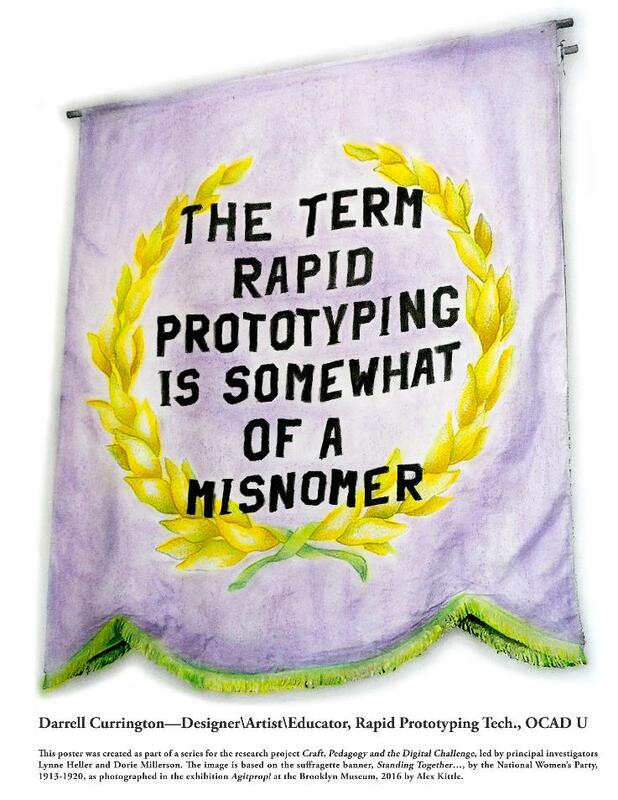 The research team realizes the world of digital craft is a complicated topic that requires more time to theorize than simply referring to the binaries of digital and analogue. The team believes in providing a voice to OCAD U faculty, staff and technicians and is looking forward to extending this opportunity to students. The Principal Investigators are developing more research with the Faculty and Curriculum Development Centre along with pursuing more funding to augment this initial pilot project. Click here to view the Craft, Pedagogy and the Digital Challenge video recorded and edited by Ellie Manning, Undergraduate Research Assistant. A note on the Posters: The quotes that appear on the posters below were developed from each of the inverviews undertaken and include two quotes from the Principal Investigators. The posters were an amalgam of both digital and analogue techniques. 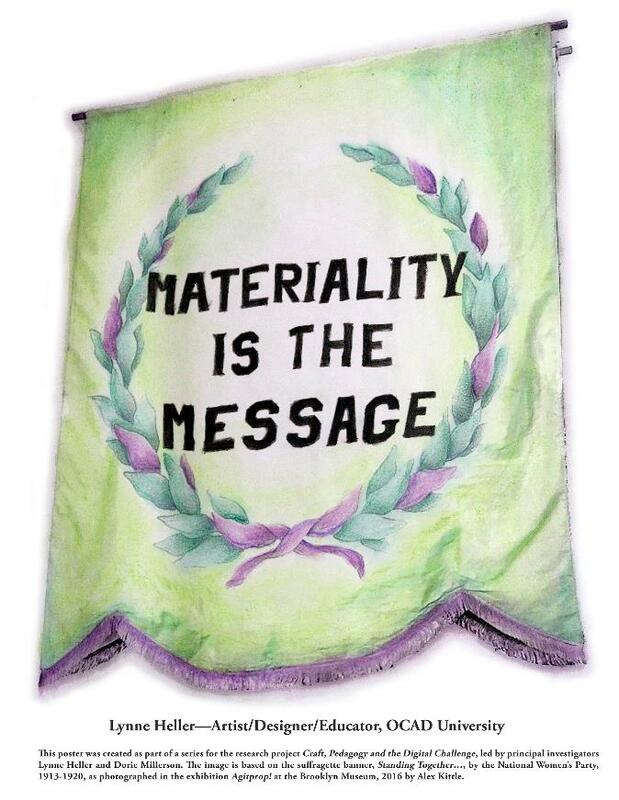 The banner image is based on the sufragette banner Standing Together ..., by the National Women's Party, 1913-1920 (as photographed by Alex Kittle in the exhibition Agitprop! at the Brooklyn Museum, 2016). The quotes were 'typeset' in Photoshop and then the posters were printed in black and white. Researchers then hand-coloured the posters using pastels. The posters are currently being exhibited in OCAD U's Office of Research and Innovation and Faculty and Curriculum Development Centre.